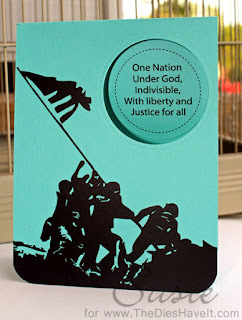 Just a quick post (and a day late) to show you a card honoring our veterans and fallen heroes. The scene on the card front is cut from vinyl and is available at the Silhouette on-line store. To make the sentiment, I used a die to cut out the circle on the card front. Then I used the same die to cut out the typed sentiment. I adhered it to chipboard and placed on the inside of the card. When the card is closed, the sentiment is quite dimensional. It is a fun technique I will surely try again! Have a great day and I'll see you right back here tomorrow.